Bring swinging style into your bird garden with this Heartwood Rock-A-Bye Birdie Bird House. 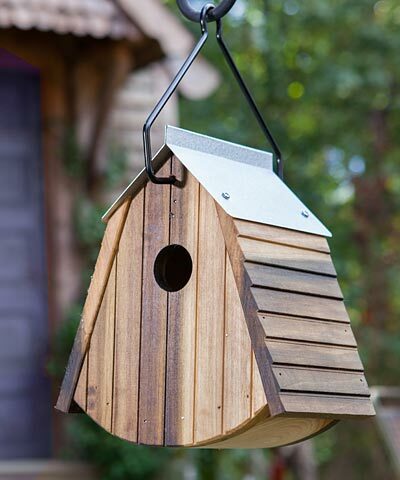 The rounded base and peaked roof of this abode add plenty of whimsy to your yard, while providing your feathered friends a fantastic sleeping spot. The muted brown and gray color scheme meshes with the outdoors, and an included black, powder coated hanger makes it simple to place this shelter. A lapped design on the roof and vertical, impressed lines on the body lend an architectural hint to the home, and a 1.375" diameter entry hole sits near the top of the front panel. This allows small birds to enter the home, and the curved base provides them nesting area. Drainage on this base helps the nest remain dry, and ventilation beneath the roof overhang aids in regulating the internal temperature. The galvanized metal sheeting atop the roof lends rustic charm to the shelter, and the poplar body adds handcrafted style. Invite birds to frolic and roost in your garden with this Rock-A-Bye Birdie Bird House. Made in the USA.